We celebrated Thanksgiving with Joy's mom and brother at her mom's apartment. The boys were a little unsure of Joy's brother at first. 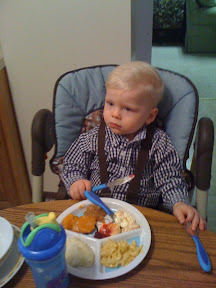 During the meal, Jasper sat at the end of the table with me on one side and Joy's brother on the other. Jasper turned his back to him and was trying to not to look at him. 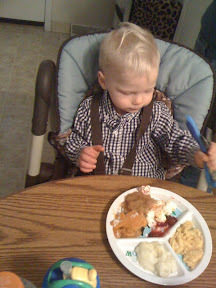 Jacob was on the other end of the table being fed by Joy's mom. Eventually, they both warmed up to Joy's brother. Jacob spend most of the time there sitting with him watching the parade and dog show. Jasper went off into the kitchen to be with grandma. I kinda dozed off a little. After that, Joy's mom came over our house so Joy and I could black Friday shop. We did great. The boys are gonna have a great Christmas! Friday night, my parents joined us for the tree festival at the convention center in Akron and the tree lighting with fireworks at lock 3. The trees were really neat at the convention center. One was made up with Beatles records that I really liked. We missed the lighting of the tree at lock 3 but caught the fireworks. The boys seemed to have a good time. Saturday, we went to the Santa parade in Akron. The parade was a lot if fun. The boys waved at the police men. Jasper loved the corvettes and old cars that were in the parade. Jacob loved people watching, mainly the kid behind us. It was a great long weekend!